(i) Notional Pay of employees who retired prior to 01.01.2016 may be fixed in the Pay Matrix on the basis of the Pay Band and Grade Pay at which they retired, by adding the number of increments he/ she had earned in that level while in service, to the minimum of the corresponding level in the matrix. Fifty percent of the total amount so arrived at shall be the revised pension. (ii) The pension, as had been fixed at the time of implementation of the 6th CPC recommendations, may be multiplied by 2.57 to arrive at an alternate value for the revised pension. 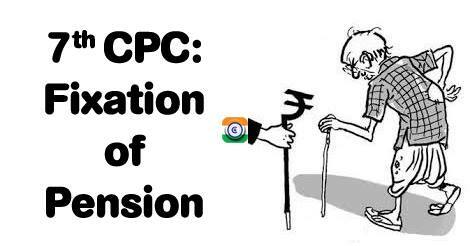 7th CPC recommended that the pensioners may be given the option of choosing the formulation which is more beneficial to them. Orders were issued for revision of pension as per Formulation (ii) above vide Department of Pension & Pensioners' Welfare O.M. No. 38/37/16-P&PW(A) (ii) dated 04.08.2016 and the pension disbursing authorities were advised to make payment of revised pension accordingly without waiting for the revised pension payment authority. A Committee under the chairmanship of Secretary, Department of Pension & Pensioners' Welfare was constituted to examine the feasibility of Formulation (i). The Committee observed that Formulation (i) as recommended by the 7th CPC might be difficult to implement in a large number of cases and this method may also cause anomalies. In implementation of the recommendations of the aforesaid Committee, orders have been issued vide Department of Pension & Pensioners' Welfare O.M. No. 38/37/16-P&PW(A) dated 12.05.2017. It has been provided that the revised pension/family pension w.e.f. 01.01.2016 in respect of all Central civil pensioners/family pensioners may be revised by notionally fixing their pay in the pay matrix recommended by the 7th CPC in the level corresponding to the pay in the pay scale/pay band and grade pay at which they retired/died by notional pay fixation under each intervening Pay Commission based on the Formula for revision of pay. 50% of the notional pay as on 01.01.2016 shall be the revised pension and 30% of this notional pay shall be the revised family pension w.e.f. 1.1.2016. Higher of the two Formulations i.e. the pension/family pension already revised in accordance with this Department's OM dated 04.08.2016 or the revised pension/family pension as worked out by notional pay fixation method, shall be the revised pension/family pension w.e.f. 01.01.2016. There were around 55.51 lakh pensioners/family pensioners (including defence pensioners/family pensioners) as on 31.03.2016. All Pension Sanctioning Authorities have been advised to accord top priority to the work of revision of pension and issue revised Pension Payment Authority in implementation of the above orders expeditiously. There is no proposal for creation of any other organisation for pension related issues. This was stated by the Minister of State for Personnel, Public Grievances and Pensions and Minister of State for Prime Minister's Office, Dr Jitendra Singh in a written reply to question by Adv. Narendra Keshav Sawaikar and Shri P. Nagarajan in the Lok Sabha today.